If we go by the words of Seth Godin, Marketing is more about telling stories rather than ranting about your products. And what is a better place for telling stories than Social Media? In a hyper-connected world where consumers are always near with their friends and family, social media offers brands with one of the best ways to connect with their audience and even build up a following. Besides Social Media is not just good for business – it is an absolute must. Now if you are looking to make a dent in the Social Media space and jazz up your game, you would need some tools to help you along. These tools can range from Content creation tools, monitoring and analytic platforms to tools squarely made for publishing and amplifying your voice in the social space. We have handpicked the 10 best social media marketing tools that are going to kill it in 2018 and laid them out for you to explore. Designed to help you post content across several platforms in an effective manner, the tool also boasts of an array of sophisticated features including creating curated collections to running campaigns. Ok, first things first – this tool offers several pricing plans for you to choose from and yet its free version is insanely popular. In the free version you will get to plan and schedule your post across 3 social profiles and can even run lead capture campaigns. However, some of its fancier features would need you to shell out some bucks. In case you wish to do that, we have listed some reasons why you might try this out. Sentiment Analysis: With this tool, you can quickly find out what others think (read say) about you in the social space. It clubs mentions of the brand as positive, negative or neutral using a machine learning based mechanism. Multiple User Support clubbed with an Approval process: Not only can you have multiple team members working on your different profiles, you can even approve the work of other team members before they go live. Advanced Analytics: Granular details about your social media presence along with the capacity to make custom reports and extract data makes it extremely popular with corporate clients. Yet another popular tool that is widely used for managing, posting, and analyzing content across multiple social media platforms. With an easy to understand interface this tool allows you to experiment with it and monitor performance on multiple social platforms from one single account. 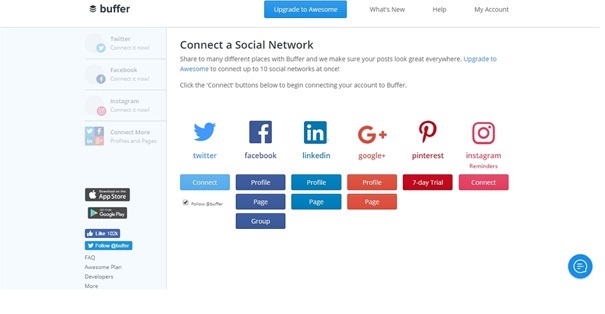 Buffer distinguishes its offerings for Individuals, Companies, and Enterprise, with each of them having a free trial period to allow you an experience of tremendous ease and intelligence. What makes Buffer one of the top 10 SMM tools is the analysis and tracking abilities that it provides. With access to its paid versions, you can make use of its other great features, a few of which have been explained here. Multiple Account Support – In the paid version you will be able to post content on multiple platforms with multiple accounts. The number of accounts supported will differ according to the plan and category you opt for. Increased Post Scheduling limits – In a paid plan your maximum scheduling limit can go up to 2000 if you opt for the highest plan in company category. This provides you ample scope to schedule numerous posts, and still have scope for more. Publishing Content through RSS Feed – Apart from publishing content on the go using Browser extensions, the paid version of the tool allows you to publish content through RSS feed as well. Social Analytics – This is the feature that is provided only in the company plans of the tool, and is completely absent from the Individual category. With the use of social analytics, you cannot only check which are your best performing posts, but also which are the ones that your audience usually relates, reacts, and engages with the most. A social media marketing tool with not much popularity but great potential. 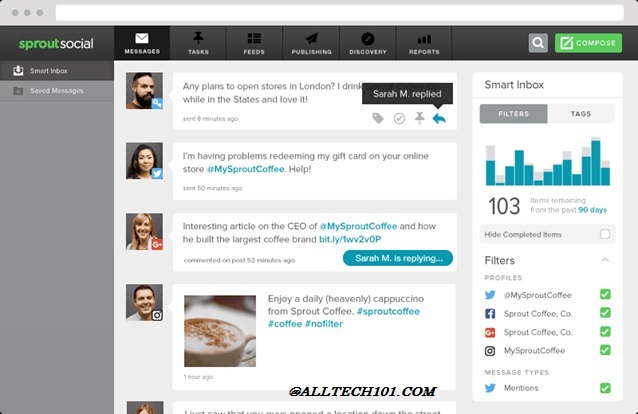 This is not just any SMM tool but a tool that provides you AI-powered abilities to manage your social media accounts. Measuring Performance – Check how your business is performing across multiple platforms, learn not just from your competitors but also from your customers through valuable industry insights. Optimizing Performance – Ensure that not just your paid campaigns but also the organic strategy yields maximum returns with the use of AI. Promote the content which is considered to be the best performing. Publish content at a time when it can get maximum impressions and engagements. Calculating Impact Analysis – Visualize and Analyze what has been the business impact of the posts you have made. This can be done by linking your social accounts to analytics, viewing results through actionable dashboards, and creating reports to ensure better marketing decisions are implemented. Creating and Posting Content- The AI can provide you with suggestions which can help you create content that is engaging as well as inspiring, and allows to acquire new customers. Maintaining Social Communities – Once you have established your social presence you need to ensure that your audiences are always provided with refreshing content on a timely basis and that there are responses and reactions to every comment they make. One of the most comprehensive tools for real-time monitoring, tracking, and managing not just your social media accounts, but also products, customers, competitors, and brand performance online, is Mention. This is a truly intelligent and helpful tool that can be used not just for monitoring social media accounts and getting comparative analysis, but also for monitoring influencer marketing and crisis management. There are different editions of the tool available for Enterprises and Agencies. The different pricing plans for the tools are; solo plan, a starter plan, and a company plan. You can find the following features in the social media monitoring functions of the tool. 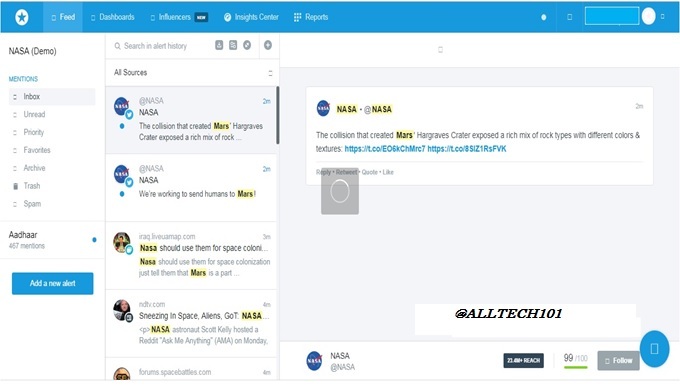 Increase Brand Awareness- With mention, you can get alerts for mentions of your brand, track what people in forums and communities are speaking about your brand. In the mention dashboard, you can get alerts for your social media accounts on various platforms and react to them in real time. Improve Brand Reputation- The built-in reports and analytics functions help you understand what is working best for your brand and customers. You can also create a list of all your influencers, and track which one of them is getting the best results for you. Use data from social listening for sentiment as well as competitor analysis. Nurture Relationships – With real-time alerts, you can fuel the interest for your brand by giving instant replies to comments and conversations around your brand. Get accurate analytics and know what all is important to your brand and what is not. 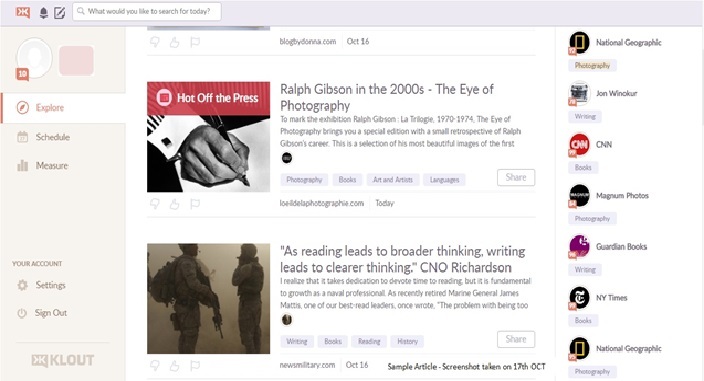 Creating Original Content- Klout gives you suggestions for creating content that is not only engaging but also one that your target audience would not have seen before. Share Content – Once you have created content you can then share it across platforms to ensure that it reaches a wide number of people. After sharing the content you can tap on the reactions of your readers and customers and get insights into what exactly are they interested in. Klout Score – This is an indicator of how well you are ranking with your customers. The Klout score is a number between 0 to 100 that determines the interest and faith of your audience with your brand. Edgar is one of those social media marketing tools that promises to increase the traffic on your website by not just increasing the visibility of your social content but by promoting those pieces of content which have a history of performing well for your brand. This is also one of those not so complicated and advanced tools for SMM, but still helpful enough to cater to your basic social media management needs. There are no multiple pricing plans for you to choose from, after a basic free trial version, you need to upgrade if you wish to continue using it. It helps in the following. Categorizing Content – Using Edgar you can ensure that your content will be neatly organized into categories automatically. 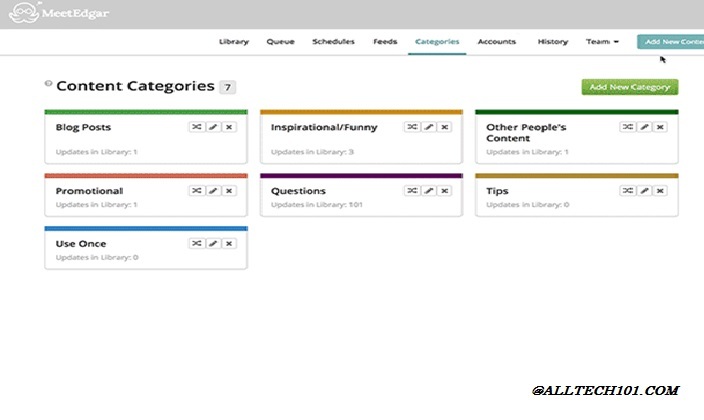 Thus creating a content library, you can also add bulk content in this library and schedule it for posting later. Increasing Website Traffic­- Edgar automates your content publishing to increase the number of views and clicks it may get. Thus allowing you to get a greater number of viewers on your website. Enhanced Engagements – The automated publishing through the tool is based on the number of users when you have maximum users online, the tool will automatically re-share content to get more clicks and comments. Recycling Old Content – Edgar puts your content in a queue once you have specified the preferred schedule, so if you ever run out of fresh content, it will make use of existing content in the category and publish it. 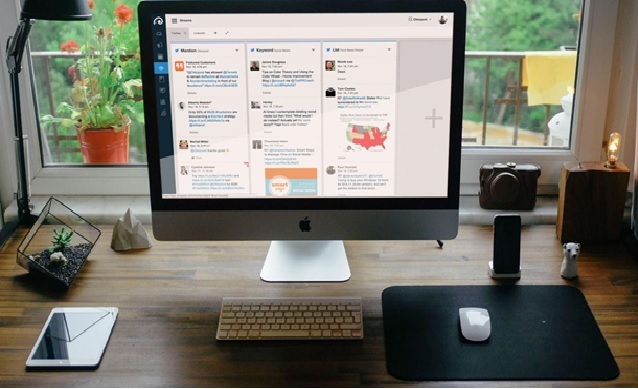 Use Sprout Social to monitor and manage your social media handles more efficiently. The tool provides you and your teams with better means to collaborate and respond to the users. Sprout Social provides you with features that make posting content and engaging with consumers entirely seamless. The analytics features of the tool give you insights not just of your performance but also of the social media trends and engagements. The tool provides its users with three pricing plans, ranging between Premium, Corporate, and Enterprise. All of these can be used for a free trial of 30 days. A few great features of these editions are listed below. 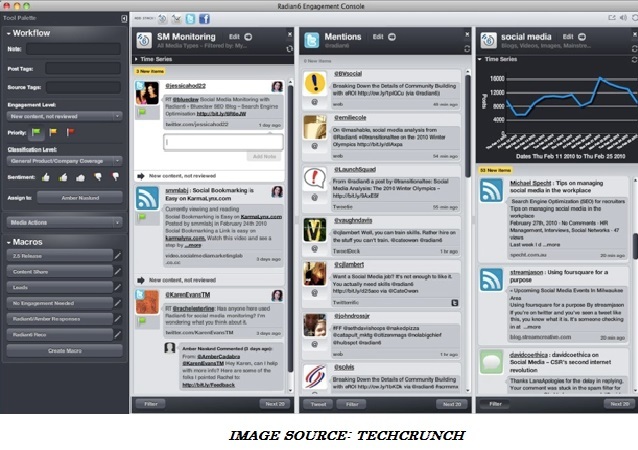 Social CRM Toolset – This is one of the multiple features you can find in the premium edition of the tool. Along with this, you can also get access to a social media calendar, an all-in-one social inbox, 10 social profiles, and more. Intelligent Reports – In the Corporate edition of the tool, you will get all premium features along with Trends Reports, Engagements Reports, Productivity Reports, Audience targeting and Campaign reports, Competitive Benchmark reports, along with 15 social profiles. Advanced Tools for Customer Care – The Enterprise edition of the tool provides you with advanced tools for customer care, these tools include advanced keyword reports, custom URL tracking, building custom chatbots, access to shared asset library, etc along with 20 social profiles. This is one of the powerful social media marketing tools that allow you to monitor your content reach and engagements across multiple social media platforms. Radian 6 was acquired by SalesForce in the year 2011. A popular SMM that can help you in monitoring your social media performance and getting accurate analytics for the same. Radian 6 provides you access to an automated tool that is used for targeting conversations across platforms and providing you important social listening insights. With your Radian 6 login credentials, you can also make use of another social media monitoring tool called Social Studio, which is also a product of SalesForce. With Radian 6 you can do the following. Monitor Brand Mentions – The key task of the tool is to give you details of the brand mentions that you are getting through your presence on multiple platforms, so you can decide which one to attend and which ones to ignore. Integration with Other applications – Since Radian 6 is a product of leading SMM tool SalesForce, you can integrate it with multiple other Enterprise level tools like SalesForce, Webtrends, Google Analytics, and more. Permission Functionality – If you are running multiple campaigns, you can allocate different roles to people to determine who has access to what all features, thus ensuring proper allocation and responsibility. This is a tool that not only helps you manage social media marketing but can also help you with multiple other online marketing activities, like email marketing, mobile messaging, remarketing, data management, etc. 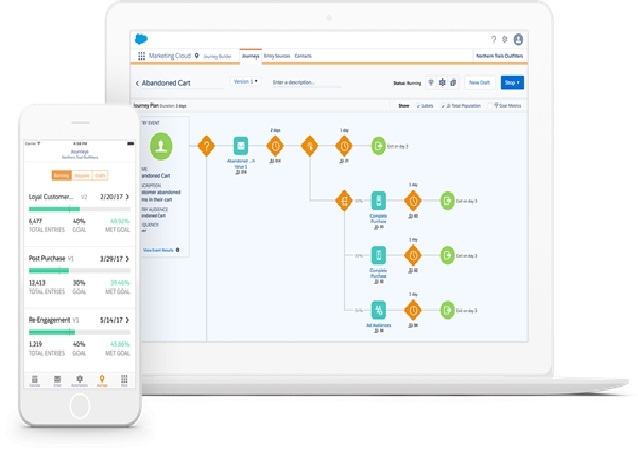 Salesforce is basically a CRM tool that is a one size fits all solution for multiple industries and operations ranging from e-commerce to finance to Iot. However, here we will only be focusing on its internet marketing capacities, further narrowing down to social media marketing only. There are four different pricing plans offered by Salesforce for SMM, all of these come with a free trial period. These plans are categorized as Basic, Pro, Corporate, and Enterprise, each designed in a way that it is more advanced and expensive than its predecessor. The versions of the tool have also been designed keeping in mind the gradual process in which the needs of a company may increase. So you can always start off with the basic plan, and progress to a higher plan only when you need to. In a basic plan you will get access to 2 accounts, 20,000 mentions per month, listening and engaging abilities with users on your social handles, and managing accounts on leading social media platforms. Apart from all these basic plan features, the remaining advanced plans offer you much more. Additional Publishing – With the help of this feature you can add on to your publishing options by paying an additional fee every month, instead of upgrading to a higher plan altogether. App Partner Access – This is the feature that allows you access to content app partners through whom you can source relevant content, stock photos, location-based content, and custom based apps. Automation – In the Company version of the tool you can get access to automation where you will no longer have to make posts manually every day. The scheduling option will ensure that the posts you schedule get published automatically. Service Cloud Integration- With this feature you can take your social strategy to a whole new level by including customer care as well. This is made possible by the integration with Salesforce service cloud, a feature that is not available in the basic and pro versions. One of the most efficient and reliable tool for SMM in B2B is Oktopost, it not only allows you to manage your social handles but also gives you an opportunity to amplify your business through SMM. Social Publishing- Don’t just post content but also manage it by classifying and categorizing your content for easy management and enhanced analysis. Here you can get access to an editorial calendar that allows you to check which content has been published where. You can opt for automation and queue your messages as well. Social Analytics – Track how the leads from your social channels are performing and which ones are converting the most. With the engagement dashboard provided in the tool you can check which of your post are getting the maximum engagements, what is the best time to post, all in the form of charts. Content Curation – Make use of the in-built content curation engine in the tool, create the kind of content that increases audience engagement. You can also customize your RSS feeds by connecting your Oktopost account with your Feedly account. Listening and Engaging on Social Platforms– Be a part of all those social conversations that are targeted to your brand, give prompt replies, track rivals, assign customer mentions and more. Social Advocacy – Reach indirect audience by getting your employers to share content that is there on your networks you can also track what content has been shared by whom and where it is getting the most traction. Social Management – Manage access to your accounts across your company by allocating different teams to different campaigns. You can also manage access and permissions in the Oktopost instance. Digital Marketing Specialist with keen eye on AD Tech and generating ROI from Content Funnels. Great read! I was looking for something like this from a really long time. Social media marketing tools have become a rage, this is great help for selecting the best social media marketing tools. « And iPhone X Sale Begin: Will Apple Make a New Sales Record?